IN addition, the RESET BUTTON really helps with COMPOUND SKETCHES! The NEW OUTS< allow interesting things...11 and 13 both have RC filters. PLUS the NEW CV INS are BI POLAR INPUTS!! AWESOME FOR ANY SITUATION WHERE YOU WANT THE NEGATIVE SWING OF YOUR WAVEFORM TO GET CAPTURED WITHOUT HAVING TO OFFSET IT FIRST!! what else...WELL? THE GATE/TRIG OUTS ARE ALL 10V capable! SO you won have to worry that some VCAS wont open! This expander has a good amount of buffering, filtering, and regulation circuitry. Everything is really solid. So...contact me for more info,etc. honestly, are you a day job designer? I love the psychedelic looks of everything you do, and even now that you have limited yourself to black and white, you still manage to make them look awesome. cant wait to get this, the silver and black ardcore is looking really great too (though im a fan of color). Great! I love your programs! By the way-Color Ardcores are still available! wow!!! I really need to get these. this is such a versatile module, i can't believe I don't have it in my rack yet. 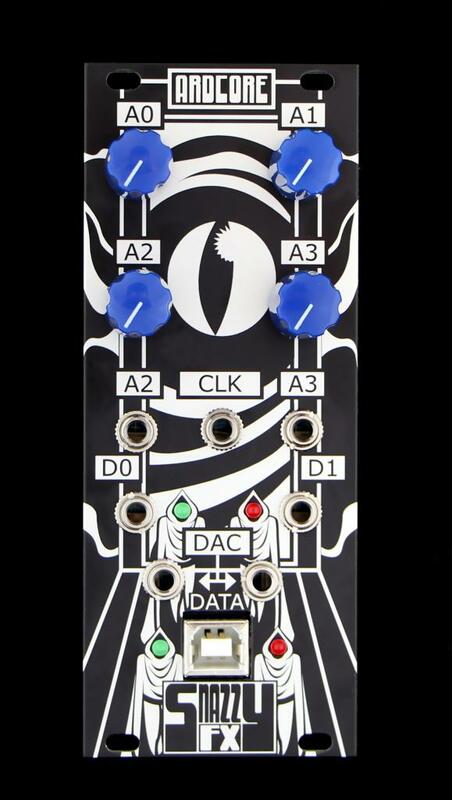 Any thoughts on the possibility of interfacing the Snazzy Expander with the 20Objects PCB? I'm just crossing my fingers here! hmmmm.... i dont know about that as I have not tried it. Keep in mind that the 20 objects PCB and the Snazzy FX pcb are completely different and use different chips and circuits. BUT with some hacking you could do it. beyond that, Yes, it would work, and you'd get the nice buffering and bipolar inputs out of the deal as well as filtering on the outs. JUST WANTED TO LET EVERYONE KNOW THAT THESE ARE AVAILABLE!! Some stores already have them and more are being shipped. IF YOU CANT FIND THEM AT YOUR LOCAL STORE, PM ME! Thanks for the update. And congrats! Cool. What's the HP of the expander out of curiosity? Sorry in advance for this critique, but can you please just nix the trippy eyeball swirly overwhelming hard to read graphics. Your modules are great, but the graphics make them too distracting in my system. I had to get the grayscale faceplates. Im not a hater in any way, but I am a professional designer, and I couldn't put the ardcore into my system until I got the grayscale panel because I am very OCD about my system being unified looking, and not having purple and green and trippy designs in it. Looking forward to getting the expander. Wiard does cool celtic stuff, which I find totally tolerable design wise. Again appologies for the harsh critique and Im sure others have said similar things, but when I clicked on this thread I was expecting a more clean normal face plate. and I feel the opposite. years ago I was considering a Wiard modular and although I love the idea, I really didn't care for the design. whereas I feel that these are some of the best looking modules in euro. I'm muddling through planning my first hardware system and this definitely has a place in it! I apologize my critique is based on my own subjective tastes and frustrations that I really should keep to myself, the grayscale faceplate is perfectly valid useful option for me. Sorry for being a jerk in this thread, several people love this design, and my opinion is just that, my opinion, and it was rude of me to voice it here. Are there European resellers for the silver ones? Ardcore and Expander on order ... should be here soon. Anyone know the current draw on the Expander?